This is a story about a young man named “Fitzy” who was bullied at school for being unabashedly gay. It is a story to remind us that while anti-gay bullying is not the only kind of bullying, and it is all wrong, anti-gay bullying can be worst kind because so often, LGBT teens have nowhere to turn for support, since even the people who are supposed to protect them — parents, teachers — can be as anti-gay as the bullies who torment them. These are the type of stories that schoolteachers and administrators ought to listen to carefully and with an empathetic ear, acknowledging the physical and emotional abuse happening to the three out of four LGBT teens that skip school for safety. They ought to acknowledge the right of LGBT teens to form gay-straight alliance support groups so gay youth are not dehumanized into a “they have it coming” category. And if they won’t do it because it is the right thing to do, then they ought to do it to avoid lawsuits that can be filed against them for not providing safety for their entire student body. Alex “Fitzy” Fitzgerald is a 16-year-old sophomore who suffered through elementary school in the Flower Mound and Lewisville school systems. He said in neither school district did he feel safe, nor did his teachers or administrators get involved enough to protect him. And he feared for his life to the point of “checking out” because of it. Fitzgerald is one of about two million U.S. school-aged youth the Human Rights Watch has estimated to be LGBTQ identified — with academic research solidly confirming 5 to 6 percent of youth are LGBTQ. Fitzgerald found himself struggling with both his gender and sexuality, and more so, severely struggling with those that said he got what he deserved when the bullies attacked him. Fitzgerald is, unfortunately, not alone. A 2008 study released by Dr. Susan Swearer and her colleagues from University of Nebraska-Lincoln and Harvard Medical School found that adolescent boys bullied for being gay — or perceived as gay — were in a much different class of bullying than non-gay youth. In fact, they found that bullied gay youth experienced much greater psychological distress, greater verbal and physical bullying and more negative perceptions of their school experiences than boys. Fitzgerald agrees. He said his path down “You’re So Gay” Lane began when he was only nine years old and wore a pink shirt to school. Fitzgerald said he was too young to understand why the other kids thought he was so weird or why they called him “gay wad.” But when the fighting and bullying escalated to the point that his mom was regularly picking him up from school crying, he begged her not to send him back. “The Lewisville fourth grade teachers could not have cared less for me,” Fitzgerald said. Hoping for more support from school staff, his mother moved him to the Flower Mound school system in fifth grade. Fitzgerald said things “started out okay” at Flower Mound, but kids in a clique soon began to pick up on his feminine, sensitive side, and the teasing and name-calling started again. Instead of conforming, Fitzgerald began to stand up for himself, declaring his identity through a variety of clothing, from his “pink emo” girly phase towards a “darker and darker goth” style. It took him awhile to try on a number of hats until one felt right, given what the environment would support. Though he didn’t realize it, Fitzgerald said the bullying was really getting to him. He began seeing a psychiatrist to treat his depression, and by seventh grade, he had started “cutting” — three shallow cuts the first time, followed by cuts that went gradually deeper, the physical pain meant to mask the emotional. His dad didn’t understand him, he said, and although his mom tried, she couldn’t either. Then that anger turned inward, and in a state of confusion, he hurt himself to cope. Experts say that flamboyant cross-gender dressing and gender nonconformity is, to a large extent, a focus of much anti-gay bullying. Swearer and colleagues say a possible explanation for the bullying of gender nonconforming individuals can be derived from a theory of moral disengagement, in which the bully dehumanizes and blames the victim for the bullying. Anyone labeled “gay” then is “deserving” of what they get. They deem it to be justice. Gender expert Michael Kimmel of State University of New York at Stony Brook said such schoolyard bullies are often the most insecure about their own masculinity and have to prove it by bullying someone who is no real match. But because it proves nothing to pick on someone not your own size, they have to do it over and over again. By the end of junior high school, Fitzgerald was openly dating both boys and girls and hanging out at the Grapevine Mills Mall with a group of friends that got high together. Though Fitzgerald dabbled with a litany of drugs, he said his “main focus” was amphetamines — speed and ecstasy. It landed him in the Lewisville emergency room and under heavy watch for drug use. But that wasn’t enough for the young man to hit rock bottom; that came later when heroine put him into detox and recovery for two months. Fitzgerald said eventually he was able to wear makeup, be androgynous or wear pink blush and paint his brows and his father finally got used to it. With the help of a good therapist, he said, the family finally was able to pull together, including Fitzgerald’s stepfather. Fitzgerald also credits his recovery to going to Youth First Texas when he was 14. He said that Bob Miskinis, the former program director, would stay on the phone with him for hours and help him work through the issues that were haunting him. YFT was the “height of my happiness and has been nothing but a blessing,” Fitzgerald said. But it didn’t last. The bullying he was then enduring was miniscule compared to what would come at Flower Mound High School. When he started school at Flower Mound, Fitzgerald said, he was shoved into walls, kicked and punched. Fitzgerald couldn’t make it alone in school. He had friends to support him, to walk him through the hallways, to keep an eye out for him, and to let him know what was “going down.” He carried a hidden can of mace for his protection, something that was against school policy, but he risked it because he was afraid for his life. No one helped, he said, adding he was treated like a disposable troublemaker. His guidance counselor was his best help, but was only able to recommend summer school so Fitzgerald could get done with school sooner. His coach warned the bully to stay away. The bullying was still brushed off as not serious and verbally abusive comments were dismissed, Fitzgerald said. Lewisville hospital again, this time with a blood alcohol level of 0.23. “In a sense, my school approved of the bullying by being silent,” Fitzgerald said, adding that there was no support to right the balance of power among peers. For example, Fitzgerald said, six times officials at the high school denied requests for the formation of a gay-straight alliance. It was a message that told gay youth they didn’t matter,” he said. And on the National Day of Silence, Fitzgerald said, students were denied permission to wear gray tape over their mouths to bring visibility to their plight. The good news for Fitzgerald is that he has found peace at iSchool High in Lewisville, a private school with about 250 students. He said he loves the teachers, who are very structured and have zero tolerance for lack of mutual respect. Fitzgerald said the reaction to bulling at iSchool goes beyond just policy; school officials actually stand by their words. Fitzgerald said he is becoming more active about LGBT equality and overcoming bullying in schools. He has been on the radio, participated in the Bully Suicide Project and, also, the It Gets Better Project. 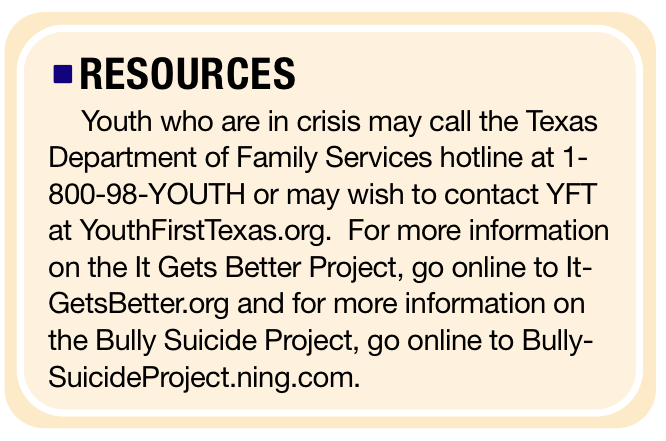 Renee Baker is a Case Manager at North Texas Youth Connection and serves on the Advisory Board at Youth First Texas. She may be found online at Renee-Baker.com. This article appeared in the Dallas Voice print edition Jan. 21, 2011. For the original posting, see here.